From "Minsan Lang Kita Iibigin" (2011), "Walang Hanggan" (2012), "Juan Dela Cruz" (2013), "Ikaw Lamang" (2014) to "Ang Probinsyano" (2015), all these said TV series starring Coco Martin were all No. 1 Primetime teleseryes leading the TV rating games and beating the rival TV programs. No doubt why Coco deserves to be called as the Primetime King as all of these TV series were all remarkable captivating the hearts of many viewers! This year, Coco relives Fernando Poe Jr.'s classic action film "Ang Probinsyano" wherein he played the dual role of Ador and Cardo. In the story, when the policeman Ador was killed, his twin brother Cardo pretended himself as Ador to continue his mission. FPJ's "Ang Probinsyano" is not the typical TV series we used to watch. It's an action teleserye full of fight and stunt scenes. And it introduces different stories with different characters in every chapter. As many said, it uplifts the quality of teleseryes we used to grew up with. And yes, "binuhay muli ng 'Ang Probinsyano' ang action genre sa bansa!" 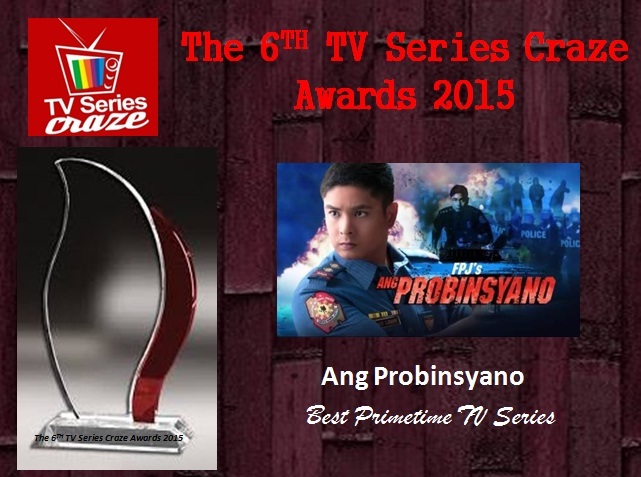 Therefore, we are giving this recognition to FPJ's "Ang Probinsyano" being the Best Primetime TV Series here in our very own The 6TH TV Series Craze Awards 2015. Coco who is also dubbed now as Idol ng Masa showcases his other side of acting aside from drama, his side as an action star!